Baton Rouge-based Epic Piping has acquired a 24,000-square-foot building on Interline Avenue that will serve as the new corporate headquarters for the rapidly growing pipe fabricator. In a deal that closed earlier today, Epic bought the property, near the Airline Highway-Interstate 12 intersection, for $2.2 million from JPO Colorado, LLC, an entity owned by Lafayette oil executive Chris Van Way. Real estate broker Benjamin Stalter of Maestri Murrell Commercial Real Estate, who represented the seller in the deal, says JPO Colorado bought the building about five years ago as an investment and that it was technically leased but had not been physically occupied for several years. Brian Nicolich of Saurage Rotenberg represented the buyer in the transaction. Though the deal closed just hours ago, renovations designed by Grace Hebert Architecture are already under way. Epic officials decline to estimate how much the building’s overhaul will cost, but say work to the roughly 40-year-old structure will be significant. Once completed in early summer, the company will relocate to the new digs from its existing offices near S. Sherwood Forest Boulevard. Nearly 80 employees will be based there. 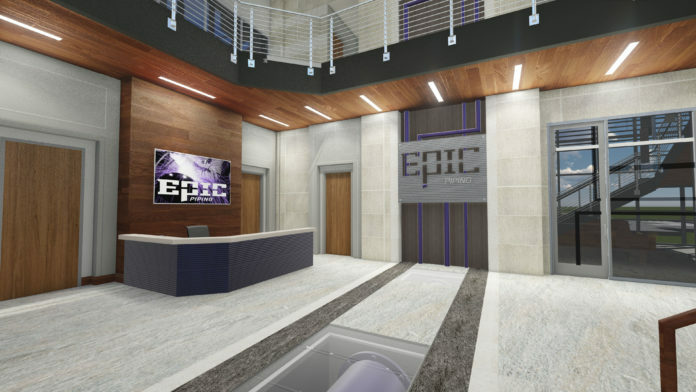 The sale comes less than a week after Epic announced plans to invest up to $40 million in the company, through growth and expansion. Epic Piping is one of the original portfolio companies created in 2014 by private equity firm Bernhard Capital Partners. In the years since, the company has grown to become one of the largest heavy pipe fabricators in North America with three major fabrication facilities that, together, produce more than 20,000 pipe spools per month: a 268,000-square-foot facility in Livingston Parish, 300,000 square foot facility in San Marcos, Texas, and 400,000 square-foot facility in United Arab Emirates.